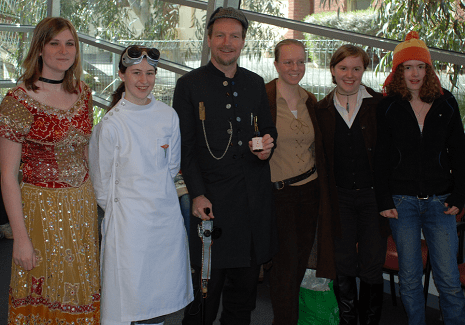 New Melbourne Browncoats, Inc. | There’ll be prizes for awesome costumes at CSTS! Melbourne Browncoats on Joy FM this Tuesday! And the prizes keep on coming! Win stuff signed by Joss! There’ll be prizes for awesome costumes at CSTS! Have you ever wanted to be Kaylee? Or Mal? What about Badger or Jayne? Well, we can offer you the next best thing… a fantastic opportunity to dress the part! We enthusiastically encourage dress ups, costumes and cosplay at Browncoat events, and CSTS is one of the best places to get your cosplay on. And this year, there’ll be prizes! We’ve got four fantastic prize packs to award to the best costumes on show this Saturday. You’ll be awarded a very snazzy award ribbon (in recognition of your overall awesomeness) plus a shiny 10 Credits (it’s Alliance currency, but it’s good across the verse). 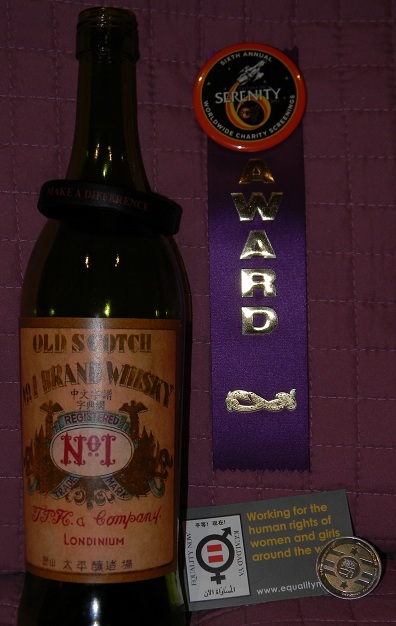 And we’ll throw in a bottle of verse inspired goodness to wrap it all up. All you need to do to be in the running for one of these prize packs is come along in costume! Anything from the Whedonverse will do! Dress as a character or create one of your own – the only limits are your resources and creativity! And speaking of costumes, did you know that one of the actual costumes from Firefly lives right here in Melbourne? The stunning dress worn by Melinda Clarke as Nandi in “Heart of Gold” (far left) will be worn by one of our gorgeous volunteers, only at CSTS. Complete with laser burns (poor Nandi) this is a rare opportunity to get up close and personal (but not too personal!) with a piece of Firefly history.